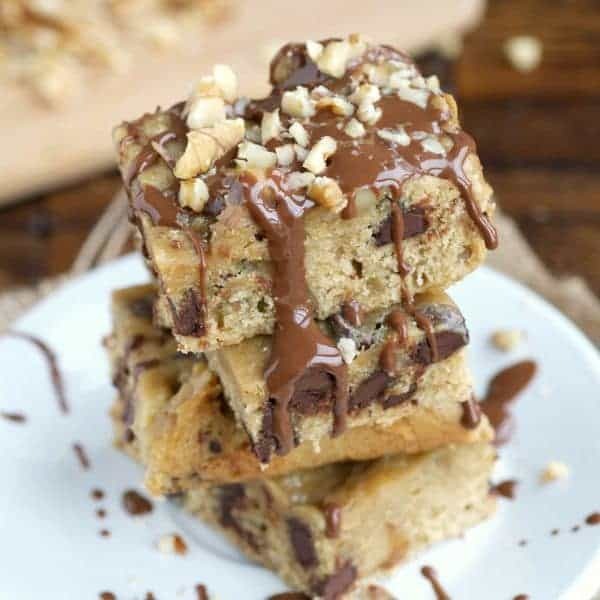 America’s favorite cookie gets a much-needed makeover (and a bit of a face-lift) with this healthy, whole wheat chocolate chip cookie bar recipe from Claire Gallam’s new book, Eat Skinny, Be Skinny. As a healthy food blogger, I could’t be more thrilled to tell you about my dear friend Claire’s new cookbook, Eat Skinny, Be Skinny. Filled with 100 recipes all under 300 calories, you are going to fall in love with this cookbook. Claire and I had the opportunity to meet in person when she attended Taste of Michigan a few years ago. Claire is a complete gem and I’m so excited for her to be sharing more of her creative, nutritious and inspiring recipes with the world. 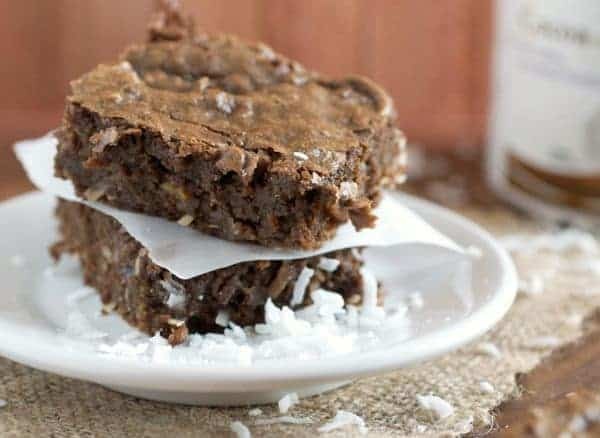 As I read through the book, it was hard to pick favorites but these Coconut Avocado Brownies are definitely on top of my list. 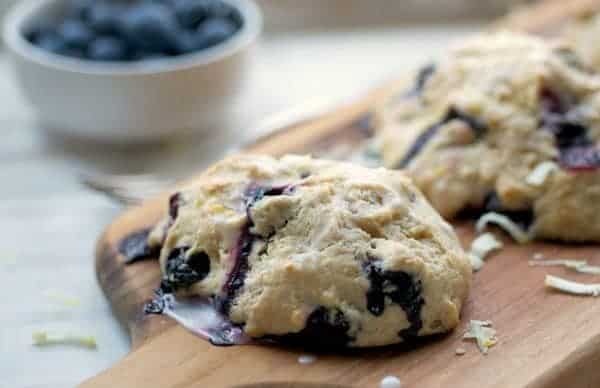 Can you believe these Lemon Blueberry Scones are good for you? Since I could only share one recipe with all of you, I decided to select these Whole Wheat Chocolate Chip Cookie Bars. Ooey, gooey, chocolate goodness that is completely guilt free is always a win in my book. 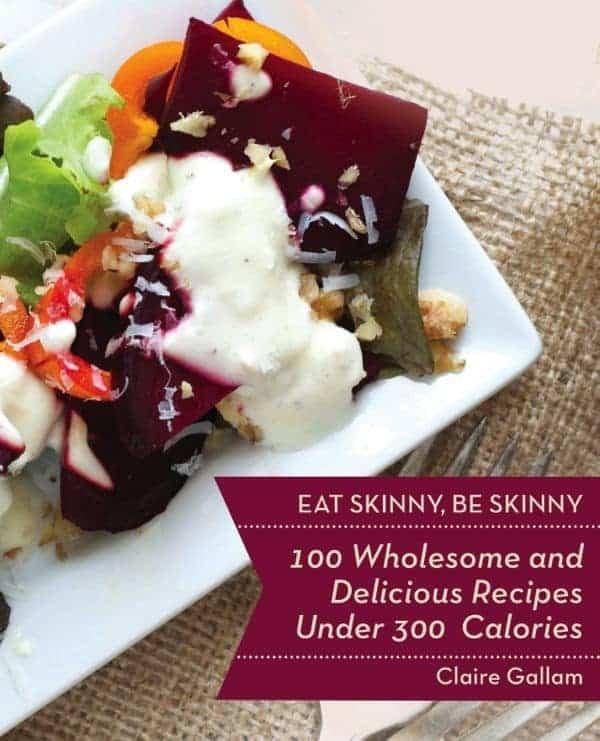 Be sure to grab a copy of Eat Skinny, Be Skinny for more mouth watering recipes that are not only delicious but easy on the waistline. America's favorite cookie gets a much-needed makeover (and a bit of a face-lift) with this healthy, whole wheat recipe. Preheat oven to 325 degrees F. Grease an 8x8 baking dish with nonstick cooking spray. Beat the sugar, applesauce, butter, egg, egg yolk, and vanilla together in a stand mixer until creamy. In another bowl,whisk the flour, salt, and baking soda together. Add the flour mixture to the butter mixture and beat. Use a spatula to push the batter on the sides down. Remove from the mixer and stir in chocolate chips and walnuts. Spread mixture into the prepared baking dish and bake for about 25 minutes. 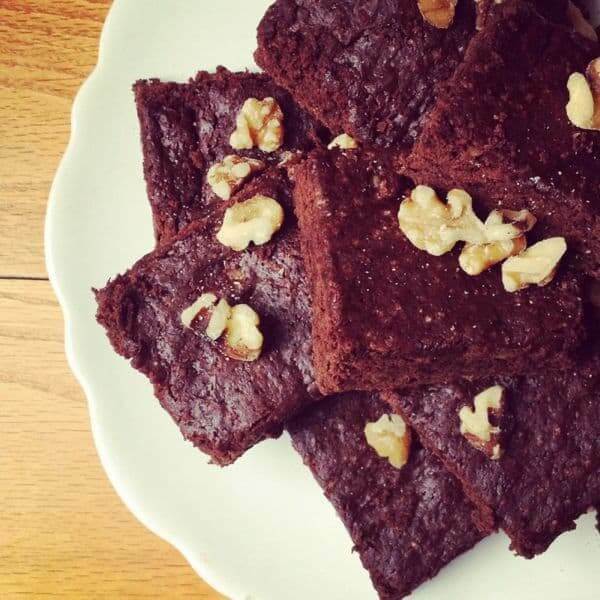 Can I substitute some of the sugar for baking Stevia? 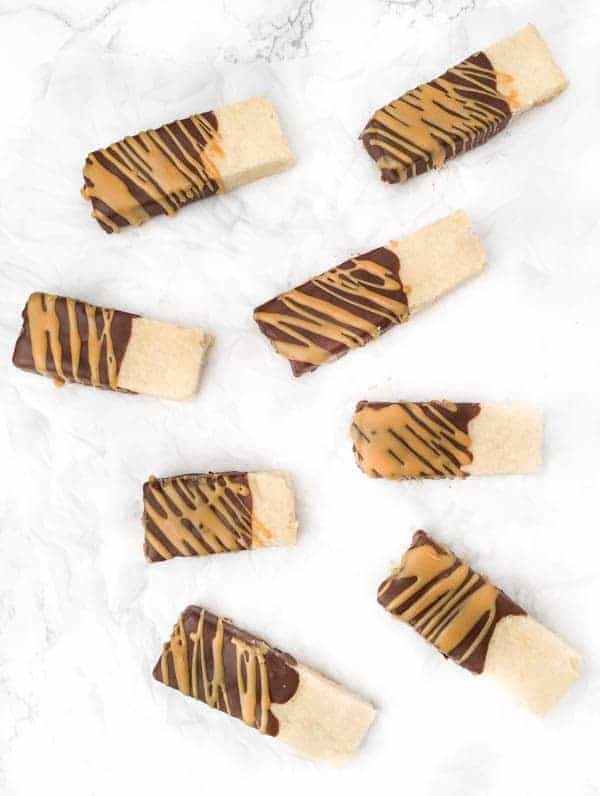 Hi Lynda – I bet you could try using the swapping suggestions on the stevia bag but I know this recipe was designed for sugar so apologies in advance if it doesn’t work. These are going to be such a fun addition to my cookie jar!! Have a feeling they are going to become a weekly thang around here! Frankly they look too good and non resistible to be healthy too. It’s heartening to see that it can be done with flair. The cookbook sounds interesting. I’d like to know if she includes savory recipes and if she includes nutrition information. Thanks. Liz, made this last night and they are terrific!!!! 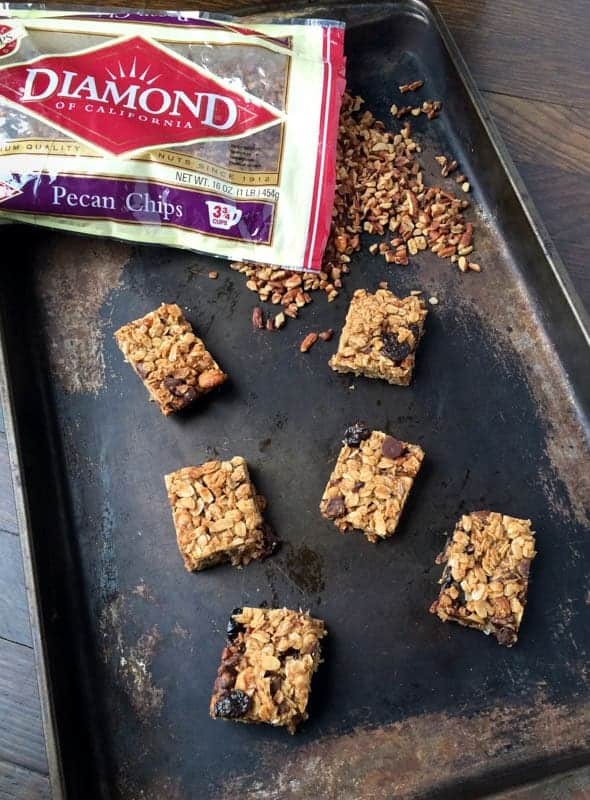 I’m in full marathon training and always looking for quality snacks and other meals with whole grains. Adding this to my “make again list”. Also, thanks for responding back to all the comments on each post. You are my favorite food blogger and appreciate the extra time and consideration you display. Oh I’m so glad to hear it!!! Thank you so much for letting me know and thank you so much for your sweet words – you made my day!!! Let me know what you think Phi! Do you use soft white wheat or hard white wheat? I grind my own wheat and some times it is hard to know which people use. I also have hard red, but usually soft white is what I use for cookies, muffins, etc. Looks yummy!!! Hi Charlotte – Do you mean for the whole wheat flour? I’ve never made whole wheat flour so I can’t quite answer your question. I love Bob’s Red Mill brand though! Just about to use this recipe for a cookie cake for my daughter and I saw your question. I know it’s old, but just in case anyone else is wondering….. In general soft wheat is the better choice for most any type of cake, cookie, pastry etc. because it is lower in gluten so it will stay soft and not tough or chewy, while the hard wheat is a better choice for breads and rolls. Basically if you don’t knead it and/or you don’t want the gluten to develop, use soft wheat. Just a word of warning on soft wheats. Kamut, eincorn, and other heritage grains are technically considered soft wheat, but they tend to be very poor choices for most pastries resulting in crumbly confections with a tendency to completely fall apart. If I am grinding my own I try to use soft white wheat for cookies and other sweet treats. Soft red wheat will work, but the wheat itself tends to be darker and more bitter. A quality I love in breads, but not so much in cookies and cakes. It’s like you knew exactly what I want to eat today. :) Can’t wait to make these!!! haha – I knew it!! These are GOOD for me? Pinch me! Congrats Claire!! How exciting! My waistline could definetly use this book! What a great theme for a cookbook. Keeping the recipes under 300 calories will make it so useful for people who are managing their weight. 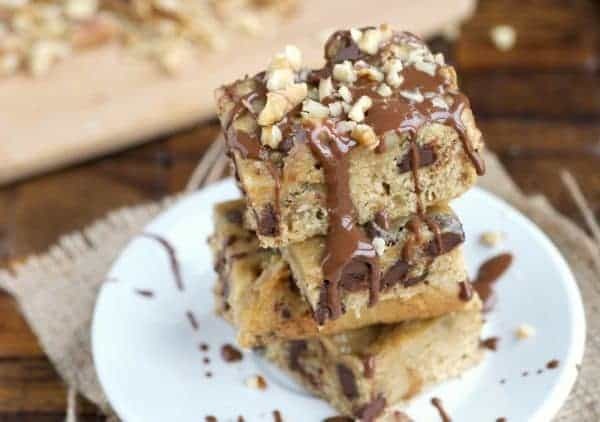 These cookie bars are amazing looking. Love that drizzle. I completely agree… thanks so much Katie!